I'm not sure how many other people remember Nextel but I do, maybe because my first job out of college used them a lot. They had one really cool feature on their phones – a walkit-talkie like functionality. You could hold a button and talk, and people on your list of numbers would get it. You could have a conversation or call for help. It worked pretty slick. Sprint bought, or merged, with Nextel and this functionality faded into history. I was reminded of this great idea when my first told me about Relay, which is a little square device that lets you do something similar. Its designed for kids and it's literally a button with a speaker – you push it and talk into it. People on your same plan with a Relay, and with the Relay app on their phone, can hear what you say and you can talk back and forth. It also has GPS so you know where your child currently is. The Relay is created by Republic Wireless, and you have to use their network, which is one of the bad things, IMHO. At least for us, not all the networks that RW used (TMobile and Sprint) aren't always great where I live. But I have found Relay support is good – for example, they sent me a replacement SIM card when I was, er, mucking around with ours. The support person noted that Sprint would be better for us than the TMobile card that they originally sent us, so they sent us a Spring SIM instead. And, yeah, it does work. Now I can run errands while my son is home during the day and I can message him where I am, and when I'll be home. Or he can be at a friend's house and I can make sure that he is there. We love it and it has made our lives a lot easier. If you are interested, here is an affiliate link for a free month of Relay. I think it's very worth it. In the past, I've installed readers myself and had it fetch updates, but I don't have the time to really monitor a server anymore. I once used Feedly so I loaded that back up. I paired down the feeds to blogs I was more likely to read and ones that were still updated. And went from there. Searching for stories/feeds was limited if you didn't pay. That never sat well with me. The Android app didn't sync very well. So an article I read an hour ago on the web would be unread on Android. Apparently this has gone on awhile and it's not solved by paying money. The paid price was too high for me. I'd like something in the middle with fewer features. But it was all or nothing. I started looking for an alternative this spring. I thought seriously about The Old Reader but the lack of an official native app stopped me. Somehow I stumbled onto Inoreader – not sure how. I had never heard of it before and did some digging and it's ran by a Bulgarian company. No matter – it got good reviews and from what I read it's "for power users". And that's kind me. And it's what I stayed with. It's interface is seemingly like Google Reader or, er, The Old Reader. Starting was easy – I exported my OPML from Feedly and imported it in. My categories and everything were moved over as well as starred items (i.e. favorites) where there. I've been using it for a few months and finally paid for the lowest plan and may upgrade a tier. The Android app syncs my feeds! They have a tiered pay structure so I don't have to pay a high price for features I won't use. Integrations are free! So I can send stories to Pocket without having to login to Pocket on my work computer. There are ads. And no I can't blame them for that. Overall I'm pretty happy with it. In an odd series of events, we played our Wii again for the first time in years. We had a lot of fun bowling and my son discovered how hard Wii golf can really be, but then he cleaned us up on the tennis court. He was a baby in the heyday of our Wii so he doesn't remember much. And let's not talk about Just Dance Kids. The Wii was clever in it's design and controls. But this post isn't to wax poetically about this game console. Instead, it's an artifact of our family history. While my son was young in our Wii-hey-day, my now-teenaged daughter was in the thick of it. Opening up and looking at the Mii's we got to see all the avatars she made over the years. Most of them were blonde girls name "Lily" but there were other names too. There were Harry Potter characters. There were also Miis named after foster kids we hand in our home… and Miis made by uncles who visited as well as by myself. My Daddy Duff Mii is still one of my favorites. It was a weird bit of nostalgia to see all those old Miis running around. And then go bowling with them. Somehow, by accident, 2018 has become the year of Emacs. I did write about some Emacs improvements I was doing, but it seems to be something I have come back to time after time. My latest work project is a large, mostly-standard Java app with some Spring sprinkled in here and there. I'm using Magit for using all my Git interfacing, which I never thought would happen – I always did the heavy work on the command-line but find Magit much more friendly now. For coding, I'm moving back and forth between Emacs and Intellij. Intellij still does a lot of nice things (like auto-import, syntax checking, etc) but I can type faster in Emacs. And, since this codebase is large and, er, not necessarily well arranged, Intellij can be slow with it. But Emacs with gradle-mode let's me do the TDD things much faster. All this to say – last week I ascended onto even a higher level of Emacs karma. Our dev team is transitioning between from Windows to Mac and some are still pedaling away on their Windows machines. This causes our commit-hook to put our ticket name (which comes from the branch name) to go from working to non-working on the Mac, because of permission issue. If I fix it, the next pull may break it. So I'm having to remember to put it in, which, so you know, just isn't going to happen. On a check-in last week, I noticed that Magit has the branch name in the comments when making a commit message. I thought "I could make a keyboard macro that uses the branch name to put in the ticket name." So I quickly created it and tested it out – it worked fine. I didn't know how, but knew I could save it for later. Sure enough I could but first I had to name it – so that was a quick C-x C-k n . I had already setup emacs-bind-map to make my own prefix to put come shortcuts. Of course, I had to run insert-kbd-macro to put in the Elisp code and the named function (the code looks like gibberish… mostly numbers) and then assigned it in my bind-map command. This is not rocket science, especially for Emacs but my shift in thinking of simply thinking "I know I can do this… let's figure it out" as opposed to "I wish I could…" or simply googling for someone's blog post. Lots of little ideas in my head that don't seem to make up a good post for each one, so I'm putting them into on. Be prepared for utter chaos. I read about a compact microtool on the Cool Tools blog and I had misplaced my (larger) Leatherman I carried in my workbag, so when we did a large Amazon order, I threw that in it. I'm so glad I did – it fits very well in my pocket and have used it lot (including using the pliers to fix a broken zipper on my son's backpack while still at school). The size is small but it's really well built. I highly recommend it. Buy it with Cool Tool's Affiliate link. It may never leave my pocket if I'm not on an airplane. I found this video about the history of orchestra hits in music absolutely fascinating. I noted that my alma mater had a story about them on This American Life. I don't have any particular love or loyalty to that place but I am interested when it gets national attention outside of athletics. I went in expecting a story about how backward of a place Nebraska is (which the reporters did do, in a very snarky way) but I left with a concrete story on at what is wrong with political discourse in this country. Highly recommend listening, regardless of your political bent or your opinion of This American Life. For reasons that I may share later, I setup ArchLinux on a Virtual Box machine to play around with. But I couldn't get the video working right – I couldn't get it to use "real" 3D animation but instead use software rendering, which made Cinnamon desktop a bit laggy. After much searching and gnashing of teeth I found this SuperUser answer which basically says that Arch is using too new of a version of Xorg and Virtual Box has no video module for that version. That… .angers me. If this posts helps the Google Ranking of that explanation, then this is all worth it. I think I need to watch this video a few more times to totally grok it but watch Karl Voit's "The Advantages of File Name Conventions and Tagging" to a new way to think about files. His date2name script is now in my permanent install list. EDITOR vs VISUAL . I didn't know there was a difference between the environment variables EDITOR and VISUAL and I always set the former. But I was way wrong. There seems little point in setting EDITOR unless you still work inside serial connections but most of us don't. Ivy, Counsel, and Swiper. I had used Helm since I read about it in Mastering Emacs. I think found this page/presentation on Ivy and friends… and I switched. I'm glad I did. Ivy display things better but it will take me a bit to getused to how Swiper displays in isearch but I'll get used to it. I started brewing beer over a year ago and, for some reason, I haven't blogged about it. Which is funny, since beer and homebrewing have become popular keywords for my web searches over the past year. And, yes, that pic above is one of my home-made brews. This started because I was an at an after-Christmas sale at my local hardware store, and oogled their 1 gal brew kits but decided that I didn't have the time nor the clearance from my wife to do it. When I got home, my wife presented me with a late Christmas present – a Mr Beer kit with an American ale. I made it that night and honestly haven't looked back. Since then I bought 3 of the kits from the hardware store when they got on lower and lower clearance and that is what I generally brew from. They are only one gallon and Mr Beer is 2. One gallon is easy to make and cleanup after, though I still use my Mr Beer fermenter to help me with bottling (a "bottling bucket" in homebrew terms). Though I may make use the Mr Beer for 2 gallons of my Christmas beer this year. Brewing your own beer is a funny thing… it's decidedly slow by our modern standards, but no technology can speed up the process. Certainly technology can (and does) make it easier for you, but fermentation is fermentation. It will take weeks, not hours, before you can taste the fruits (or hops or esters, what you will). The yeast does has the yeast does. I've make quite a few beers in the last year or so. Most OK, one was outstanding (my Christmas beer) and one was so bad I just poured it out. I found out later it got infected by a foreign yeast and that made it taste horrible. Why? Because I didn't clean my siphon out when I was testing it. That brings up the most important thing about homebrewing – it's all a learning process. You can learn a lot by reading and researching the forums but, ultimately, it comes down to your setup and equipment. I only do 1-2 gallon brews and I boil my wort on my kitchen stove. I have different problems and advantages that someone brewing 5 gallons (like they have to do it outside, they deal with more grain, but they make a lot more than 4-5 750ml bottles at a time). And my equipment and setup is different than another small-batch brewer, so any kind of idea they may have I have to think about how to add it to my arsenal. So there is a lot of trial and error involved, even if you think you have it all figured out. The Mash After removing the bag of grains, I put them in colander in it's own separate clean pot, and take a few coffee cups of the wort and pour it over the bags a few times. This is called sparging or lautering. This may not seem like a big deal with my 1 gallon batches but since I've been doing it, the flavor of my beer has gotten better. Bottling Hours before bottling, I boil some water and put the amount of sugar I need in a coffee cup and pour the water in it with a spoon. Every once in a while, I give it a stir with the spoon. This is less trouble than measuring each tab of sugar for each bottle. How do it do this? Bottling After I have my fermenter ready, my bottles sanitized, and sugar dissolved, I pour the sugar water into my sanitized Mr Beer and then siphon the beer from the fermenter into the Mr Beer. I wait a minute or two for the sugar to spread out through the beer and then use the spigot to fill each bottle with beer. Easy-peasy. Bottle Conditioning I've found 4 weeks isn't enough time to leave it in bottle. I've found I don't get enough carbonation with it that long, or flavor. I have a Belgian Wit on Month 4 on the counter and it's just starting to be good. Maybe it's because of the temperature in my house, etc, but just doesn't work. Lastly – the best change I ever did in my homebrew experiments is to change my sanitizer to Star San. 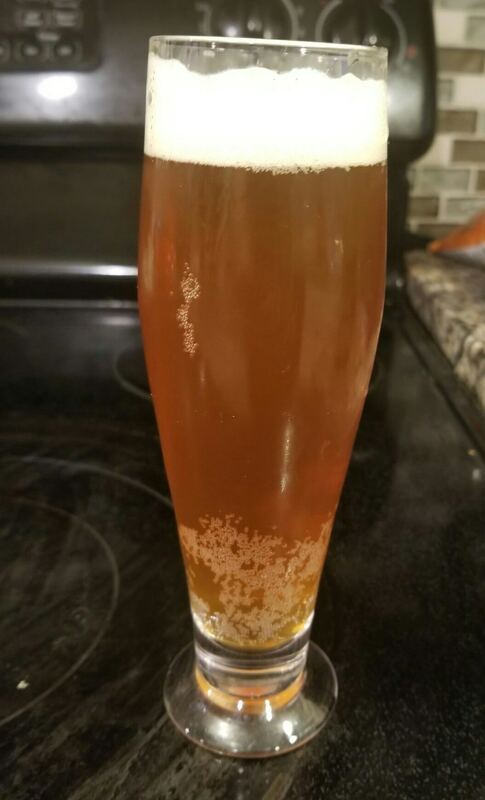 My beer came out better, and it actually carbonated. It seems pricey but a little bit goes a long way. I make a gallon and keep it in a glass jar for a few months and just re-use it. Worth the effort and don't fear the foam! (because, yes, it does foam. a lot). I've failed to blog about one of my more geeky things I've done in the past year – setup a RetroPie. Note that it's not Retro/Pi/ because you can install it on more things than a RasberryPi… though that is exactly what I did. For the 2016-17 school year, my daughter had a big science fair project, she wanted to do something with programming and her and I talked about different RaspberryPi projects. She picked one and did very well with it on the school and metro levels. All that is besides the point but the fact that we had a Raspberry Pi 3 laying around the house in the fall of 2017. It has a case, and HDMI I started looking at what I could do with it. After some research I figure out a RetroPie system would be a fun thing -for me- for my kids to have. Setting it up honestly is pretty easy if you do the pre-made images. I tried installing it over a pre-made Raspbian install but kept running out of room… which is important when you start putting ROMs on there. I got the image on an SD card and installation went pretty easy. I won't get into procuring your own ROMs… that exercise is up to the reader. Some of the emulators for the new systems do tax the Pi a bit, but things like Sega Genesis and NES are no problem. Even PS1 is fine, though I never have taken the time to figure out how to do multi-CD games with it. I found it handy to have a wireless keyboard on my Pi during setup and hanging around in case I need it. I bought a cheap Logitech keyboard with a dongle I just keep in one of the Pi's USB slot. Works nice.. but now that my Pi is setup I rarely use it. For controllers, I tried a cheaper Bluetooth game controller but I never could get it to work right. Save yourself some trouble and get a use PS3 controller. It worked fine after I paired it. It's also well-supported on the RetroPie platform so kinda makes this a no-brainer. I got mine used, which saved me some money but didn't come with a cord, which is a mini USB cord (not a micro, which works in most Android phones). Also, keep it plugged into your Pi when not playing to keep it charged. I didn't do that and recently couldn't figure out why it didn't charge until I plugged into my Mac. It seems to need data to charge. Apparently an XBox 360 controller works very well too. They may be cheaper. EmulationStation is the front-end interface. It's the fancy menu system that use you to choose your game. It also has menus to get into controller settings, etc. RetroArch is the program that knows what emulator to use to run your ROMs and starts the appropriate one. Sometimes there are more than one valid emulator and RetroArch will pick the default one. You can easily change the default, or set the best emulator for that particular game. It also is where you do to save and load stat of the ROM. You know, so you can quickly save your place on that really hard game and so you can go back when you die. I interface with RetroArch by hitting the PS button on my controller. The emulators. I let RetroArch handle all of this. There are a lot of them, but really RetroArch does the work. When you start a game, EmulationStation calls RetroArch and RetroArch does it's thing. When you quit playing (for me, PS2 button, push B, Quit) then RetroArch will also quit and EmulationStation will appear on the screen. All this is pretty painless but it's important because when you go to the forums if you have problems, you will see them talk about each individual component. Another interesting thing that RetroPie includes is a Samba share. This makes transferring ROMs from where you, er, get them to the Pi as easy and copy and paste over the share. But, as I said above, knowing a bit about the emulators is a good idea because you have to know what ROM goes in what folder. Excuse me while I continue to free my kingdom from the hordes of Runefast. I've been trying to improve my emacs-fu for the past while. It was probably 18 months ago I declared bankruptcy on my duct-tape and bailing wire Emacs config and started fresh with Projectile and haven't regretted it for a second. I started reading the Emacs Reddit, which introduced me to Magit and OrgMode. Magit was hard for me to start and now it's become my preferred way to interface with git. OrgMode was even a shorter transition… I'm not running my entire life with OrgMode but I do use it for notes and my personal knowledge base. But my fu stalled. I had a hump that I couldn't get over. I started to look if there was a current deep-dive book in the wondrous world of Emacs and I found one – Mastering Emacs by Mickey Petersen. It seemed to be the book that I needed but the thoughts on Reddit were mixed. Lots liked it but others pointed out that you could find most of it on the Internet or through the Emacs help. It was good for beginners but not for experienced users. I decided to give it a shot. And I'm glad I did. I am a self-taught Emacs user. I glossed over things at the beginning of my Emacs venture that I didn't understand and never went back. I didn't know that then, but I know that now. Mastering Emacs is the first tech book in a long time I've read cover-to-cover, taking notes and making bookmarks as I've went. I've referred back to it many times in trying to get more helpful commands in my daily workflow. I gleaned a lot and – ironically – the biggest point Petersen makes is that Emacs is self-documenting. You can search the help with Emacs any time and it will actually be helpful. That, he claims, is the most important thing to mastering Emacs. I have to re-learn and re-orient myself to that idea… but I'm slowly getting there. Occur Mode – basically search on steroids. And then edit said lines. Learning those four things would be enough.. but Petersen also gives a great guide to Eshell (available on his site) as well ad Dired, and other goodies. But, overall, his idea is that you should be able to learn about Emacs through the help documentation. Type C-h and behold what you can find out about. If you are an Emacs power user that knows about these things, then I don't recommend it. If you are an "normal" Emacs user then I really, really think you should. It's worth every penny. I spend a lot of my day online. Searching for solutions for projects, restaurants, advice, etc. Online forums, restaurant review sites, and many other places … my browser history is big every day. Sometimes I get a little disturbed by how often my searches show up in ads showing to me – not just in GMail but Facebook, etc. I know I'm not the only one that is concerned. This post describes all the steps I took. This post is filled with things I have done. The timeframe is about a year and a half. I deleted my Twitter and Facebook app off my mobile devices and only access them via browser. That way I feel I have more control wiht permission on my device. This is something I did before with limited success but doing it now seems to be better. I use Chrome for GMail and social media (Twitter, FB, etc) and do my daily browsing in Opera for everything else. Yes, I'm That Guy That Uses Opera. Actually Opera is basically Chrome with smaller memory and with built-in ad blocking. I find Opera really, really fast. And it can use Chrome extentions with no problem. So, yeah, I use Opera for all my searching and day-to-day work. And it's lovely. And I do this both on my desktop and mobile. So, yes, I use Opera on my phone as well. Actually their mobile browser is what I used first. Anyway this is not a commercial for Opera – it's just what I use. I should also point out that Opera owns/is ran by an ad company . But I trust Norway with my data more than I do US Entities. Go figure. Now I felt pretty secure online but I kept reading about online fingerprinting… that even thought you were blocking ads, that advertising and bad people (which not all advertisers are) can finger print your browser characteristics and figure out who you are without sessions or cookies. While it is not full-proof, Privacy Badger does a good job of not only keeping the tracking toxins out of your browser make it look generic enough that you aren't tracked. It learns as you surf. So maybe it's not great on Day 1, but Day 3 gets a lot better. You can test your own browser at EFF's Panopticlick . I dare ya. I like Google. It works better than anything else. But is it worth the cost? I decided to do an experiment and set my default search to DuckDuckGo and, if it didn't get an good answer (especially on my particularly thorny technical questions) I would then Google it. And you know – DuckDuckGo wasn't just merely adequate, in many situation I like it better. DDG is smarter about showing you results. So if you do a search where a video may be the best answer, it automatically takes you to the videos. If you search for a something that has an answer in say, StackOverflow, it will show you the accepted answer on the top, as all as listing other results. Saves you a click. Features, not more results, is an important distinction. Oh and their ideas about privacy are great too. Therein lies my journey and my current status. Pardon me while I get a new tinfoil hat – I've worn this for over 2 hours.